Know about the procedure for cleaning validation and cleaning validation protocol and reports as per WHO. Method of sampling, Analytical methods and limits of recovery of swabs. worst case study in cleaning validation. 1.1 The objectives of good manufacturing practices (GMP) include the prevention of possible contamination and cross-contamination of pharmaceutical starting materials and products. — breakdown products of the detergents, acids and alkalis that may be used as part of the cleaning process. 1.3 Adequate cleaning procedures play an important role in preventing contamination and cross-contamination. Validation of cleaning methods provides documented evidence that an approved cleaning procedure will provide clean equipment, suitable for its intended use. 1.4 The objective of cleaning validation is to prove that the equipment is consistently cleaned of product, detergent and microbial residues to an acceptable level, to prevent possible contamination and cross-contamination. 1.5 Cleaning validation is not necessarily required for non-critical cleaning such as that which takes place between batches of the same product (or different lots of the same intermediate in a bulk process), or of floors, walls, the outside of vessels, and following some intermediate steps. 1.6 Cleaning validation should be considered important in multi-product facilities and should be performed among others, for equipment, sanitation procedures and garment laundering. 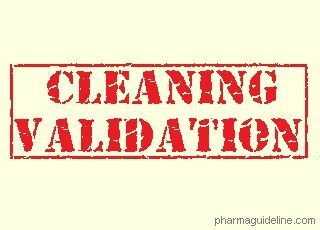 2.1 These guidelines describe the general aspects of cleaning validation, excluding specialized cleaning or inactivation that may be required, e.g. for removal of viral or mycoplasmal contaminants in the biological manufacturing industry. 2.2 Normally cleaning validation would be applicable for critical cleaning such as cleaning between manufacturing of one product and another, of surfaces that come into contact with products, drug products and API. 3.1 There should be written SOPs detailing the cleaning process for equipment and apparatus. The cleaning procedures should be validated. • periodic evaluation and revalidation of the number of batches manufactured between cleaning validations. 3.3. At least three consecutive applications of the cleaning procedure should be performed and shown to be successful to prove that the method is validated. 4.1.1 Cleaning validation should be described in cleaning validation protocols, which should be formally approved, e.g. by the quality control or quality assurance unit. — size of the system. • the choice of the cleaning agent should be documented and approved by the quality unit and should be scientifically justified on the basis of, e.g. 4.1.4 Cleaning procedures for products and processes which are very similar do not need to be individually validated. A validation study of the “worst case” may be considered acceptable. There should be a justified validation programme for this approach referred to as “bracketing”, addressing critical issues relating to the selected product, equipment or process. 4.1.5 Where “bracketing” of products is done, consideration should be given to type of products and equipment. 4.1.6 Bracketing by product should be done only when the products concerned are similar in nature or property and will be processed using the same equipment. Identical cleaning procedures should then be used for these products. 4.1.7 When a representative product is chosen, this should be the one that is most difficult to clean. 4.1.8 Bracketing by equipment should be done only when it is similar equipment, or the same equipment in different sizes (e.g. 300-L, 500-L and 1000-L tanks). An alternative approach may be to validate the smallest and the largest sizes separately. 4.2.1 The relevant cleaning records (signed by the operator, checked by production and reviewed by quality assurance) and source data (original results) should be kept. The results of the cleaning validation should be presented in cleaning validation reports stating the outcome and conclusion. 5.1 Personnel or operators who perform cleaning routinely should be trained and should be effectively supervised. 6.1 Normally only procedures for the cleaning of surfaces of the equipment that come into contact with the product need to be validated. Consideration should be given to “non-contact” parts of the equipment into which product or any process material may migrate. Critical areas should be identified (independently from method of cleaning), particularly in large systems employing semi-automatic or fully automatic clean-in-place systems. 6.2 Dedicated equipment should be used for products which are difficult to clean, equipment which is difficult to clean, or for products with a high safety risk where it is not possible to achieve the required cleaning acceptance limits using a validated cleaning procedure. 6.3 Ideally, there should be one process for cleaning a piece of equipment or system. This will depend on the products being produced, whether the cleaning occurs between batches of the same product (as in a large campaign) or whether the cleaning occurs between batches of different products. 6.4 The design of equipment may influence the effectiveness of the cleaning process. Consideration should therefore be given to the design of the equipment when preparing the cleaning validation protocol, e.g. V-blenders, transfer pumps or filling lines. 7.1 Detergents should facilitate the cleaning process and be easily removable. Detergents that have persistent residues such as cationic detergents which adhere very strongly to glass and are difficult to remove, should be avoided where possible. 7.2 The composition of the detergent should be known to the manufacturer and its removal during rinsing, demonstrated. 7.3 Acceptable limits for detergent residues after cleaning should be defined. The possibility of detergent breakdown should also be considered when validating cleaning procedures. 7.4 Detergents should be released by quality control and, where possible, should meet local food standards or regulations. 8.1 The need to include measures to prevent microbial growth and remove contamination where it has occurred should be considered. 8.2 There should be documented evidence to indicate that routine cleaning and storage of equipment does not allow microbial proliferation. 8.3 The period and conditions for storage of unclean equipment before cleaning, and the time between cleaning and equipment reuse, should form part of the validation of cleaning procedures. 8.4 Equipment should be stored in a dry condition after cleaning. Stagnant water should not be allowed to remain in equipment after cleaning. 8.5 Control of the bioburden through adequate cleaning and appropriate storage of equipment is important to ensure that subsequent sterilization or sanitization procedures achieve the necessary assurance of sterility, and the control of pyrogens in sterile processing. Equipment sterilization processes may not be adequate to achieve significant inactivation or removal of pyrogens. 9.1.1 Equipment should normally be cleaned as soon as possible after use. This may be especially important for operations with topical products, suspensions and bulk drug or where the drying of residues will directly affect the efficiency of a cleaning procedure. 9.1.2 Two methods of sampling are considered to be acceptable. These are direct surface sampling and rinse samples. A combination of the two methods is generally the most desirable. 9.1.3 The practice of resampling should not be used before or during cleaning and operations and is acceptable only in rare cases. Constant retesting and resampling can show that the cleaning process is not validated because these retests actually document the presence of unacceptable residue and contaminants resulting from an ineffective cleaning process. 9.2.1 Factors that should be considered include the supplier of the swab, area swabbed, number of swabs used, whether they are wet or dry swabs, swab handling and swabbing technique. 9.2.2 The location from which the sample is taken should take into consideration the composition of the equipment (e.g. glass or steel) and the location (e.g. blades, tank walls or fittings). Worst case locations should be considered. The protocol should identify the sampling locations. 9.2.3 Critical areas, i.e. those hardest to clean, should be identified, particularly in large systems that employ semi-automatic or fully automatic clean-in-place systems. 9.2.4 The sampling medium and solvent used should be appropriate to the task. Note: This method allows sampling of a large surface, of areas that are inaccessible or that cannot be routinely disassembled and provides an overall picture. Rinse samples may give sufficient evidence of adequate cleaning where accessibility of equipment parts can preclude direct surface sampling, and may be useful for checking for residues of cleaning agents, e.g. detergents. 9.3.1 Rinse samples should be used in combination with other sampling methods such as surface sampling. 9.3.2. There should be evidence that samples are accurately recovered. Note: This method relies on the manufacture of a placebo batch which is then checked for carry-over of the previous product. It is an expensive and laborious process. It is difficult to provide assurance that the contaminants will be dislodged from the equipment surface uniformly. Additionally, if the particles of the contaminant or residue are large enough, they may not be uniformly dispersed in the placebo batch. 9.4.1 The batch placebo method should be used in conjunction with rinse and/or surface sampling method(s). 10.1 The analytical methods should be validated before the cleaning validation is performed. 10.2 The methods chosen should detect residuals or contaminants specific for the substance(s) being assayed at an appropriate level of cleanliness (sensitivity). 10.4 The detection limit for each analytical method should be sufficiently sensitive to detect the established acceptable level of the residue or contaminants. 10.5 Suitable methods that are sensitive and specific should be used where possible and may include chromatographic methods (e.g. high pressure liquid chromotography (HPLC), gas chromotography (GC), and high pressure thin-layer chromatography (HPTLC)). Other methods may include (alone or in combination) measurement of total organic carbon (TOC), pH, or conductivity; ultraviolet (UV) spectroscopy; and enzyme-linked immunosorbent assay (ELISA). Note: uniform distribution of contaminants is not guaranteed. 11.1 The acceptance criteria established for contaminant levels in the sample should be practical, achievable and verifi able. The rationale for the residue limits established should be logical, and based on the knowledge of the materials involved. 11.2 Each situation should be assessed individually. The manner in which limits are established should be carefully considered. In establishing residual limits it may not be adequate to focus only on the principal reactant, because other chemical variations may be more difficult to remove. 11.3 Where necessary, screening using thin-layer chromatography should be performed in addition to chemical analyses. 11.4 There should be no residue from the previous product, from reaction by-products and degradants, or from the cleaning process itself (e.g. detergents or solvents). • use different safety factors for different dosage forms based on physiological response (this method is essential for potent materials). 11.6 Limits may be expressed as a concentration in a subsequent product (ppm), limit per surface area (mcg/cm2), or in rinse water as ppm. 11.7 The sensitivity of the analytical methods should be defi ned to enable reasonable limits to be set. 11.8 The rationale for selecting limits for carry-over of product residues should meet defi ned criteria. • no more than 0.1% of the normal therapeutic dose of one product will appear in the maximum daily dose of a subsequent product. 11.10 The most stringent of three options should be used. If we have indentified that our most stringent is visually clean, do we still need to validate the analytical procedure?